Peroxide Cure EPDM rubber offers many of the same great properties of premium grade EPDM rubber, with enhanced temperature and compression set qualities. Peroxide Cure EPDM rubber also offers resistance to steam, and is the premium choice for applications subject to weathering. Peroxide Cure EPDM rubber provides select chemical resistance and is recommended for hot water, alcohols, ketones, engine coolants, organic and inorganic acids and bases. Premium grade EPDM rubber is not resistant to mineral oils, greases and fuels. Depending on the application, EPDM rubber can be cured with sulphur or peroxide. Peroxide Cure EPDM rubber has better chemical and thermal resistance than Sulphur-cured. The peroxide cure process dramatically improves the heat stability and compression set characteristics of the compounds. Sulphur-cured EPDM can resist temperatures up to 120C (250F), where as peroxide cured EPDM can resist a temperature up to 150 C (300 F). Compounded premium grade peroxide cure EPDM rubber is popular among many industries to limit bloom, an issue associated with sulfur cured EPDM. 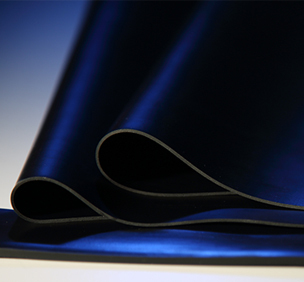 Peroxide Cure EPDM rubber also has excellent physical properties including mechanical strength. It should not be used with fuels, greases and mineral oils. All BRP rubber is American-made in their Lima, Ohio facility.